Odubel Herrera's error in Boston led to Philly's fourth straight loss. The Phillies are headed into the month of August as one of the most improved clubs in Major League Baseball, and also one of the most confusing teams in terms of how they are getting it done. When this season began, if you had suggested the Phillies would be engaged in a playoff race with first place in hand as the team headed into August, most everybody would have taken that as a huge success. More than that – if you watched first-year manager Gabe Kapler make some odd decisions during the first series of the year, you might think this was all fiction. Well, as they say in sports – you can’t make this stuff up. Was Asdrubal Cabrera trade a good or bad deal for the Phillies? The Phillies suffered their fourth consecutive loss on Monday night in Boston where the whole good/bad of the season was put on display at Fenway park. On the plus side, Aaron Nola further cemented his position as the ace of the staff, and one of the premier pitchers in all of Major League Baseball. Nola was remarkable through eight innings, never in danger of losing control of the game. No matter what chaos unfolded behind him, Nola simply shook it off and spun magic at the Red Sox. The bigger the moment, the better Nola reacted. What the Phillies have in Nola is a pitcher who is capable of standing on any mound with baseball royalty. Nola went right at the Red Sox lineup, and if there had not been such horrible mistakes behind him this would have been a week of celebrating Nola – not just in Philadelphia, but across of all of Major League Baseball. The show put on by Nola and Red Sox starter David Price was a throwback to the days of pitching duels. It was only the 14th time this season that each starter went eight innings and it should have been a real celebration of baseball. Forget pitch counts, forget two times through the lineups. This was two pitchers who wanted to do it all, and truth be told Aaron Nola won the battle. In a fair world Nola would have had a shutout victory over the best team in baseball. 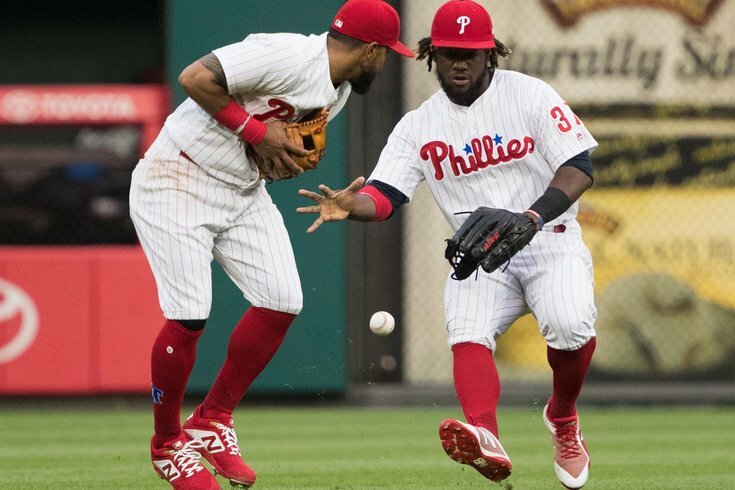 Instead, Nola and the Phillies were undone because Odubel Herrera reverted to some old issues – a misplayed fly ball, and a base running blunder that took them out of an inning. The mistake in the outfield led to a “triple,” leading to a run. It was actually a three-base error, and it deflated what should have been a huge night for Nola and the Phillies. The base running error was a little less hurtful, but if Herrera had not run into a double play at third base the Phillies would have still been in position to get a much needed run with a runner in scoring position. Instead, the Phils were out of the inning as Rhys Hoskins erased after taking off on the run-on-contact play. It was a horrible night for Herrera, which made it a horrible night for the Phillies. Despite the usual after-a-loss spin cycle from manager, the problems with Herrera and the brain cramps in general are no small matter. Manager Gabe Kapler said he had a “chat” with Herrera about the mistake at third base, but there needs to be more than a “chat” when the mistakes are so large. Any manager would have problems with Herrera but there seems to be no way to get to make him think about the game at a higher level. He is a marvelously talented outfielder who makes a highlight catch once a week and can carry the team with big hits. Kapler might have to live with Herrera because of his talent, but that doesn’t mean Kapler has to put a silly positive spin on any mistake – and it’s not just the situation with Herrera. In just the past week he tried to dismiss a big mistake by catcher Jorge Alfaro on an obvious passed ball when even Alfaro acknowledged he should have made the play. Despite the great improvement from last season the Phillies have been a sub standard team defensively, and they can’t get the job done with runners in scoring position. The addition of Carlos Santana has not been the bat the Phils thought they were getting, and the experiment with Scott Kingerey at shortstop has not been effective. The team needs more offense from that position, and general manager Matt Klentak has to figure out who needs to stay and who needs to go. Klentak has put the team in that odd combination of developing players and bringing in veterans to win now. What Kapler has to do now is to make sure that the developing players learn that there is an accountability when mistakes get made. It might be a nice philosophy to pump up the team’s confidence when things get tough. However, there are times when some tougher words are needed, and with the month of August looming this would appear to be one of those times. Sometimes you just can’t live with the mistakes and pretend it’s not big deal.